Inspired by the lost voices of the Romany Holocaust this heartbreaking and tender novel will appeal to readers who loved Sophie's Choice, Schindler's Ark and The Book Thief. Austria, 1944. Jakob, a gypsy boy - half Roma, half Yenish - runs, as he has been told to do. With shoes of sack cloth, still bloodstained with another's blood, a stone clutched in one hand, a small wooden box in the other. He runs blindly, full of fear, empty of hope. For hope lies behind him in a green field with a tree that stands shaped like a Y. He knows how to read the land, the sky. When to seek shelter, when not. He has grown up directing himself with the wind and the shadows. They are familiar to him. It is the loneliness that is not. He has never, until this time, been so alone. 'Don't be afraid, Jakob,' his father has told him, his voice weak and wavering. 'See the colours, my boy,' he has whispered. So he does. Rusted ochre from a mossy bough. Steely white from the sap of the youngest tree. On and on, Jakob runs. 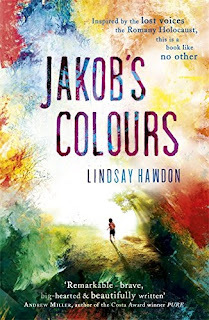 Spanning from one world war to another, taking us across England, Switzerland and Austria, Jakob's Colours is about the painful legacies passed down from one generation to another, finding hope where there is no hope and colour where there is no colour. 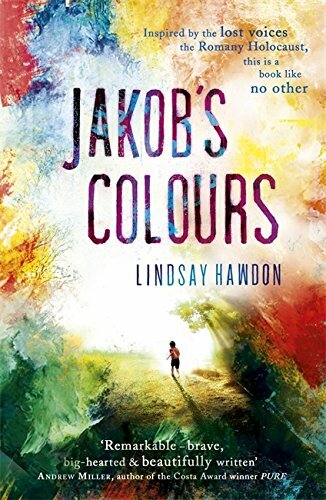 I rarely sneak a peek at a book as it drops through my letterbox but the mesmeric cover of Jakob's Colours attracted me like a moth to a flame. Once I had sneaked a peek there was no going back as chapters flipped back and forth between 'This Day' and 'Before' and I just had to find out what had happened. Eight year old Jakob is alone at the beginning of the book so it is clear that something awful has happened to his family, and the book is about the Romany Holocaust after all. In the chapters 'Before' and 'Long Before', Lindsay Hawdon has made sure that the voices of Jakob's mother and father, Lor and Yavy, are heard so evocatively that you forget you are hurtling towards a shocking ending. As we discover how Lor and Yavy met, the inclusion of authentic Romany language adds additional depth to these already colourful characters. Jakob is an amazing boy who has survived against the odds during World War II. There is a part of the story where an old man has hidden Jakob, and two others, in a cupboard so the Germans don't find them. The compassion that Markus shows is humbling, as he shares his food with his hidden visitors and takes beatings from the German soldiers. Jakob's will to survive helps him to cope with his self-enforced captivity and he draws strength from his fellow captives, who are willing to sacrifice everything so that Jakob can be free. Completely devastating and utterly compelling, Jakob's Colours is a book that stayed with me long after reading the final page. At times shocking, it gives a powerful voice to all those poor souls who unnecessarily lost their lives during World War II.